If you already have the stereoscopic 3D video clip ready you can quite easily upload it to YouTube and you just need to enter something specific in the field for tags at the end of the list of tags you’ve provided for your video. The tag you need to enter as a last one is “yt3d:enable=true” (without the quotes) as you can see in the screenshot above – have in mind that this tag needs to be at the end and not specifically to be the only one entered. And that is it your stereoscopic video is uploaded an being processed and when it is ready you should be able to view it in the available Stereoscopic 3D modes that YouTube currently supports. Here s a list of stereoscopic 3D modes that the YouTube player currently support with the main focus being the anaglyph modes, but there is also support for cross-eyed viewing method that does not require special hardware and there are even experimental modes for row interleaved viewing for passive polarized display users and a few others (including option to view just the left or right video frame in “plain 2D”). As you can see so far there is not way for you to directly watch the videos in stereoscopic 3D mode if you are using Nvidia’s 3D Vision setup, but do not loose your hope as there is actually a quite easy workaround. You just need to download the High-quality or High-definition version in MP4/MOV format of the YouTube video you want and then play it back through the NVIDIA 3D Vision Video Player without problems. And if you have some issues with playing back the downloaded movie you might need to first setup the codec list of the 3D Stereo Player in order to add the installed MP4/MOV splitter/decoder in your system (Settings / Decoder / MPEG4 Stream Splitter). 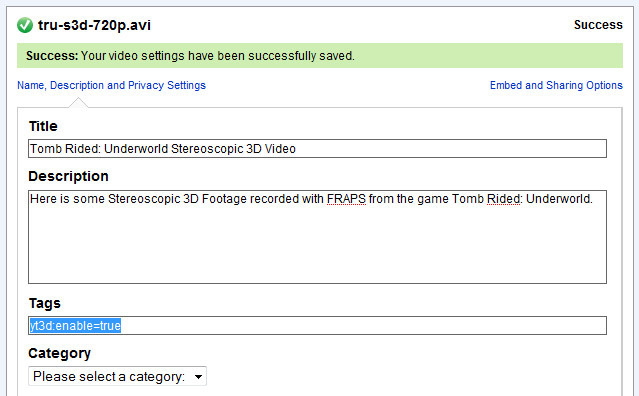 Have in mind that there are some possible issues when sharing Stereoscopic 3D videos through YouTube. I’m talking about the limited resolution the Stereoscopic 3D videos are being processed at and then made available for the user. And then there is the issue wit the quality as when the video gets re-encoded with a lower resolution an bitrate than the original one being used, so watching through the player or downloading it afterwards might result in not that great quality. If you want to upload 1080p stereoscopic 3D video or even a clip with 720p quality to YouTube you should forget about that with the reason being that you still get 1280 and 1920 maximum width for the re-encoded content you’ve uploaded as stereoscopic content. So for true 720p quality you’ll be uploading video with resolution of 2560×720 that will be downsized to 1920×540 (1080p HD) and 1280×360 pixels (720p HD), so you might consider recording the video in one of these two resolution, if you plan to share it exclusively through YouTube. This way you might achieve better quality when the video is being just recompressed and not resized by YouTube, but still it depends on a lot of other factors so it still might be considered to be a trial and error at first.